Seven years in the making, $15 million budget, 10,0000 costumes, 8,000 extras, 300 sets, 222 minutes runtime, $80 worldwide gross, 11 Oscars… Ben-Hur’s staggering stat-attack bulges further with this monolithic Collector’s Edition : four discs and 10 hours of bonus material. Fitting treatment for a widescreen mega-epic that saved MGM’s lion from the wolves, rescued cinema from the tube and finally convinced Charlton Heston that he was indeed bigger than Jesus. Just like its leading man, William Wyler’s 1956 classic is overblown, grandiose, pompous and still an awesome spectacle. No CG backdrops. No copy’n’paste extras. Just the kind of all-or-nothing cinema that will never, ever be attempted again. A matinee hero cast in fractured bronze, Heston rages through his biblical odyssey of revenge via some of cinema’s most ferocious, thrilling set-pieces (that chariot race stills rips up the screen) and, better still, fails to realise he’s bitching it in Hollywood’s most furious gay love story. 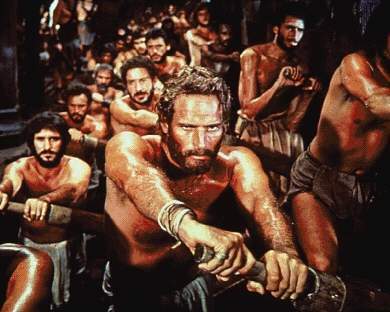 How co-star Stephen Boyd and scripter Gore Vidal kept a homo heart thumping inside Ben-Hur’s rippling chest is fully illuminated along with the rest of the film’s fascinating journey to the screen on hour-long doc The Making Of An Epic. It’s a superb tee-up for the rest of the DVD set, which also bundles the 1925 silent original – a stunner in its own right. Heston and film-historian T Gene Hatcher weigh in with a full-length, full-calorie commentary, while DoPs, composers and production designers from Malcolm X to The Matrix doff their caps to Ben-Hur’s legacy in The Epic That Changed Cinema. Even George Lucas and Ridley Scott own up to their steals in Episode I and Gladiator. More treats come in the shape of screentest footage (Leslie Nielsen IS Massalla!) and highlights from the 1960 Academy Awards, which reveal the only thing that wasn’t big about Ben-Hur: its Oscar-acceptance speeches. Wyler’s Best Director thank-you? A whopping 13-seconder. No, they don’t make ’em like this anymore.